When is it YOUR time to shine? A favorite sketchbook exercise of mine: painting these blossoms from all different angles. I just wrapped up another six-week session of teaching watercolor sketchbook art to ten people, and I have to admit, I find it thrilling to see everyone's progress each week. Some of them have been taking classes with me for a while, some where brand new, and all of them dedicated to learning and growing the creative side of their life. During the last six weeks the weather cooperated incredibly well (ok, except for one night where there were tornados touching down on the other side of our tiny state!). Except for that one beastly weather night, the rest of our sessions enabled us to be outside - painting in local gardens and preserves. 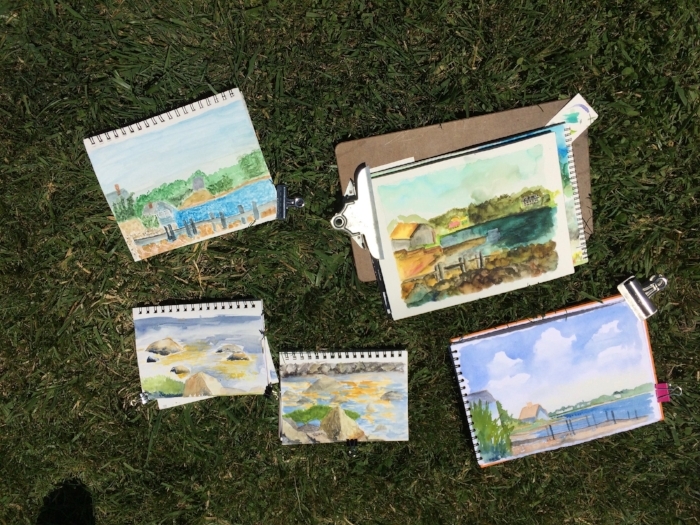 The morning classes afforded us time and daylight to get around to some mighty fine sites in our area, and even the evening class got a couple chances for the "plein-air experience". I started what we called, "the throw-down" at the end of each class....where we'd come together and as a group talk about our accomplishments of that day. It's great to celebrate the victories with your friends, and get advice on areas where you need help, encouragement, or finding other possibilities. No one is allowed to 'bash their own work' (or anyone else's). We know internally when there are portions of a painting that bother us, and it's good to know that with time and diligence there are ways to improve....AND TRUST THAT WE ACTUALLY CAN! But within every painting, at any level, there are gems - victories that we have won through our focus on that one thing. 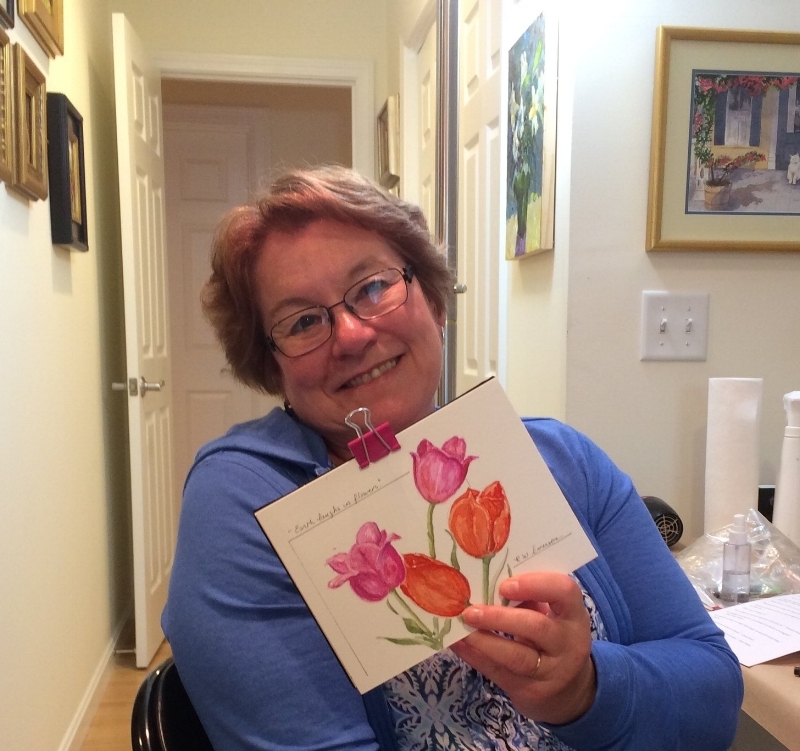 Whether it's color mixing, drawing accuracy, pigment to water ratios, you name it...there are plenty of things within the medium of watercolor to learn. Learning these via sketchbook entries is an easy way to go about it. 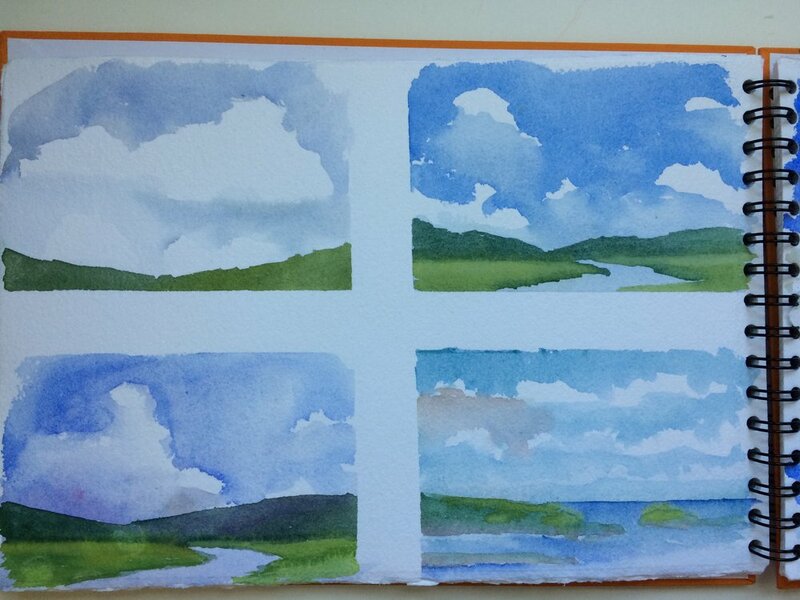 "Chunking" , or practicing these little groups of cumulous clouds, getting a feel for where I want hard crisp edges, and where do I want to soften them? Another way of learning is called 'chunking'. For our purposes, you might think of it as focusing on one aspect at a time. Perhaps you're really going to focus on 'water to pigment ratios' in this sketch until you really get the feel for that. Or maybe your focus will be on perspective with your drawing skills and you'll concentrate on simple buildings until you feel comfortable with that. Mastering one thing at a time takes the pressure off of feeling like you have to complete a master-piece every time you go out to paint! The Peak Performance Center defines it like this: Chunking is a strategy used to reduce the cognitive load as the learner processes information. ... Essentially, chunking helps in the learning process by breaking long strings of information into bit size chunks that are easier to remember. "Chunking" , more practice with direct painting and clouds. But enough of the intellectual focus, the emotional reaction to color, and specifically the watching watercolor 'do what it does best' is the most exciting thing. It keeps me wanting to learn more and more about this medium. It's so exciting to see the artists in my sketchbook classes gain skills. Many people have started the classes with the perception that "watercolor is the hardest medium". And while it can have it's challenges, once we understand it's capacity, and learn to work with that, it becomes pretty exciting. We learn to take the edge off of our 'control freaky' side, even if just a bit. We learn to allow our curiosity to risk things on paper. We learn where we can or should rein things in a bit. Throw-down time. Here's where we talk about what works, and where our focus will be in upcoming sketch work. In some of our classes this last session, we've focused on 'direct watercolor' where we go in directly with the brush, with out drawing in pencil first. Those were some really liberating exercises. It was a good follow-up to the exercise in blind-contour drawing. Some of us have committed to a 30 sketches in 30 days online challenge with this technique (direct watercolor). While I can't imagine ever ditching my pencil completely, I know this method has expanded my skills. Anyways, I just wanted to share a bit about what my classes have been tackling en plein air this session. Seeing their accomplishments and witnessing that "shine" and glow from their faces when we've spent a couple hours focused on our craft, makes my heart sing! I hope you find a desire to grow your creativity, because your time to shine is NOW! Time to shine! Her efforts have paid off beautifully! You and Me in France next June 2019! Wait, What's This About Going Blind?